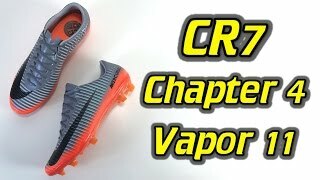 The newest edition of Cristiano Ronaldo’s CR7 Boots series is Chapter 4 “Forged for greatness”. These boots are recognition of Ronaldo’s 5 years at Manchester United, which elevated him from a young hot prospect to world class player. Ronaldo (aged 18) joined United on the August 12th, 2003 with great expectation and hype, after glowing referrals from Rio Ferdinand and Gary Neville. However, the pressure magnified as Sir Alex Ferguson told the young Portuguese winger he would follow in the footsteps of former United Legends, Best, Robson, Cantona and Beckham, by playing in the Number 7 shirt. Cristiano embraced the pressure and soon took the Premier League and Champions League by storm, whilst repaying the faith put in him by Ferguson. This transformation from a young, slim tricky player to a world star is the main inspiration for the Chapter 4 CR7 Boots. The boots iconic colour gradient design of red merging to orange then metallic grey represents the forging of metal, is a tribute to the city of Manchester and the man himself. The CR7 boot has numerous signs that pay homage to the transformation of the player from boy to man and player to brand. 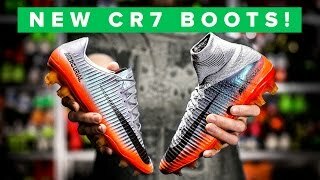 This is evident with the highlighting of the 7 in the CR7 logo inside the boot which represents the Ronaldo’s transformation from number 7 to the brand CR7. Nike has also etched the number 28 in Roman Numerals (XXVIII) on the heel cap, however, the number 7 (VII) is highlighted in a different colour to show his journey from playing number 28 at Sporting Lisbon to number 7 as we know him today. Nike’s popular Mercurial range is for the players who game involves burst of speed and acceleration throughout the pitch. 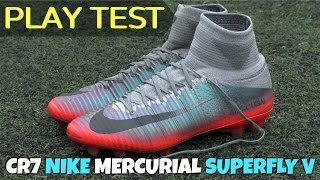 The features included on the Mercurial Superfly V are thanks to years of research from specialists and feedback from the man himself. 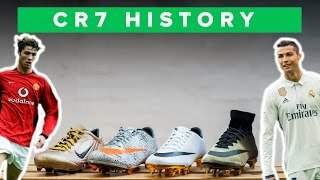 So what is so special about the 4th chapter of the 7 part CR7 series? First things first, how do these boots increase your speed of the mark? This boot is designed to allow players to control the ball more when dribbling, passing and shooting at speed. It improves touch and brings the players foot closer to the ball due to the Speed Rib cable structure inter-woven through the Flyknit upper. These cables produce friction between the ball and the foot, whilst locking down the foot against the insole. This increased lockdown sensation creates a responsive boot and allows the player to complete sharp turns. Nike has done well to manufacture a boot that feels like an extension of your foot. The upper is flexible and one complete seamless piece allowing for enhanced fit and comfort, whilst the removed tongue aids with control and an even closer contact with the ball. The upper also contains Nike’s light and breathable NikeSkin performance mesh and the performance benefits of Nike’s All Conditions Control technology for playing in any weather. These boots are comfortable from the first time your wear them. This is due to the Dynamic Fit Collar. The Collar is the sock-like section of the boot which covers the ankle and holds your foot in the best anatomical position. The support added by the Dynamic Fit Collar increases your focus and attention towards your feet and gives the sensation of the boot becoming an extension of your leg. Therefore decreasing any distraction and the actual feeling of wearing a boot. The Superfly V highlights Nike’s reinvention of a football boot outsole. In the past boots had a flat base, however, Nike’s researcher created an outsole that followed the shape of the foot. 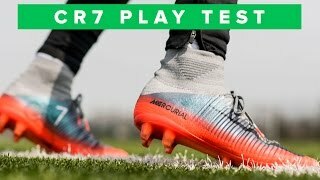 The outcome was a stronger nylon chassis that was 40% lighter, curved and more responsive than the previous Mercurial Superfly models. This gives the boot a more natural fit by reducing any gaps in the sole area, whilst the Split Toe function at the front of the boot increases traction on the turf and the foots flexibility capabilities. As this boot is made for the speedsters, the stud design caters towards acceleration and deceleration. This is important for any player as improved agility can be the difference in beating your opponent to the ball or tracking back to defend. The Stud construction was created by assessing the foot’s flow of power and pressure points. This enables Nike to strategically place the studs in the position of maximum effectiveness, enabling the boot to provide the grip where it’s most needed. Unlike other boots, Nike has added slanted stud to rake back the turf in a clawing motion for increased speed and acceleration/deceleration.